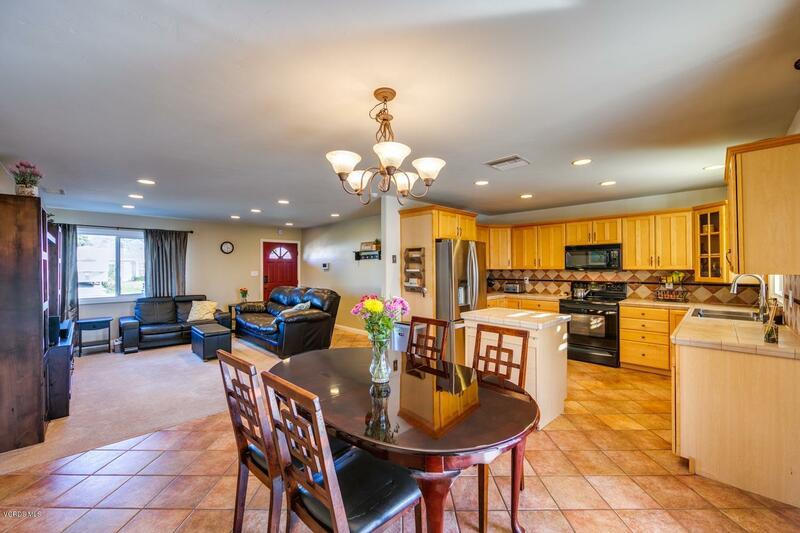 Welcome home to one of Simi Valley's finest single story pool homes! This one is a true Entertainer's Delight! Remodeled and Open Floor Plan is perfect for all. Enjoy cooking in the Spacious Kitchen with Center Island, newer kitchen cabinets, neutral tile countertops with decorative backsplash and recessed lighting. Kitchen opens to the formal Dining Room which overlooks the fabulous backyard with drought tolerant tropical landscape, sparkling pool and covered patio area. Pool has removable safety fencing. Light and Bright Living Room has recessed lights and sits open to the dining room and kitchen. All ceilings have been scraped and dual paned-windows throughout. Both bathrooms have tubs with tiled showers and newer vanities and lighting. All three bedrooms have ceiling fans and mirrored wardrobe doors. Neutral paint throughout. Kitchen, dining, entry, hallways and baths have lovely tile flooring and newer carpet throughout living room and bedrooms. Central Air Conditioning. Newersewer line, clean out and bathroom sink drain lines. Front yard drought tolerant landscaping with flowering rose bushes and shrubs. Steps away to fabulous Vista Fundamental Elementary School. Confirm enrollment criteria w/ CVUSD. Close to 118, shopping, dining and parks.